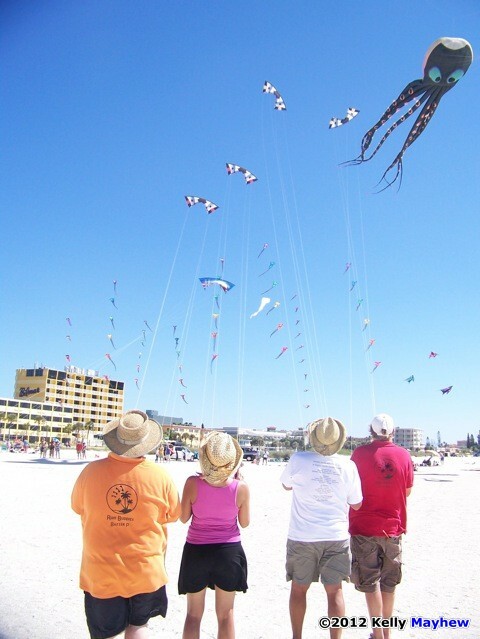 In order to tell you about KiteOberFest I have to give you a little background on Kiting Tampa Bay. 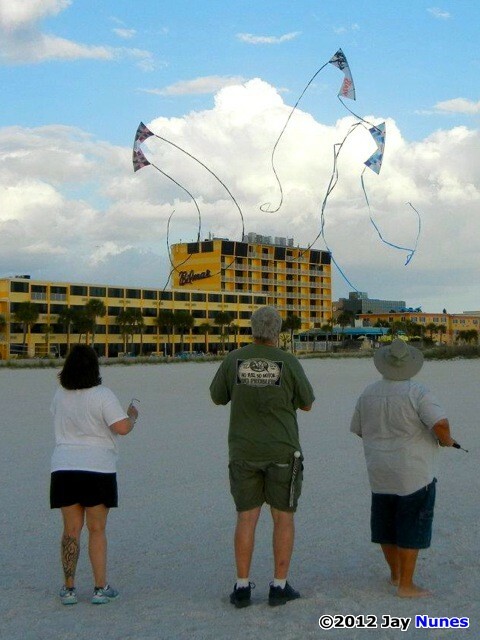 It’s October 2011 and my wife, Kelly Mayhew, and our best friend, Starna McKinnon, and I were flying kites on our home ground at Treasure Island beach Florida. 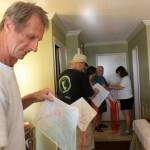 We were discussing why there were not more kite flyers enjoying one of the best places to fly in America. 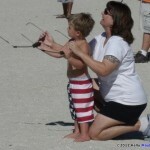 We decided to take matters into out own hands and Kiting Tampa Bay was born. 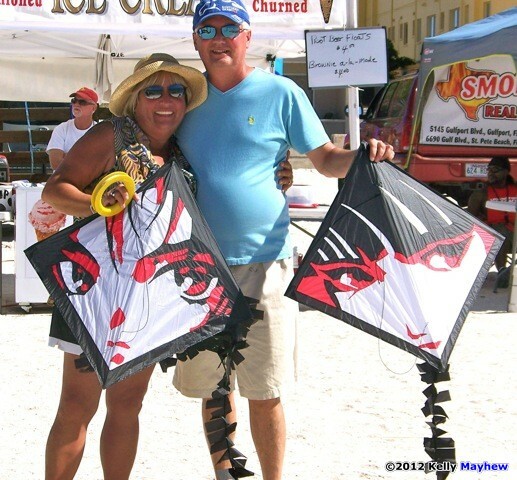 Our motto;” Just friends flying Kites”. 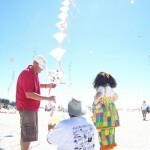 Our first order of business was to create a Facebook page and connect with as many Kiters as we could. Before we knew it we had over 1000 friends and the excitement quickly built about our club and the possibilities here in Florida. 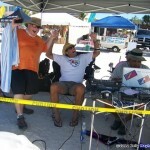 In November 2011 KTB hosted its first official fly with special guest Dave Humes on black Friday dubbed “No Lines but Kite Lines”. There were about six people in attendance if you count the homeless guys that came by to sell us trinkets. That didn’t detour us one bit. The next event was in December. 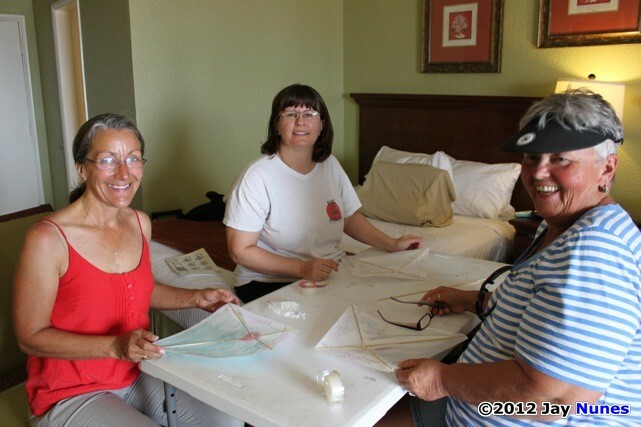 Glenn Davison was coming to Florida and wanted to host a miniature kite making workshop just days after he first contacted us. Once again there were four of us in attendance. We were inside and could not officially count our homeless friends. Our resolve was stronger then ever. 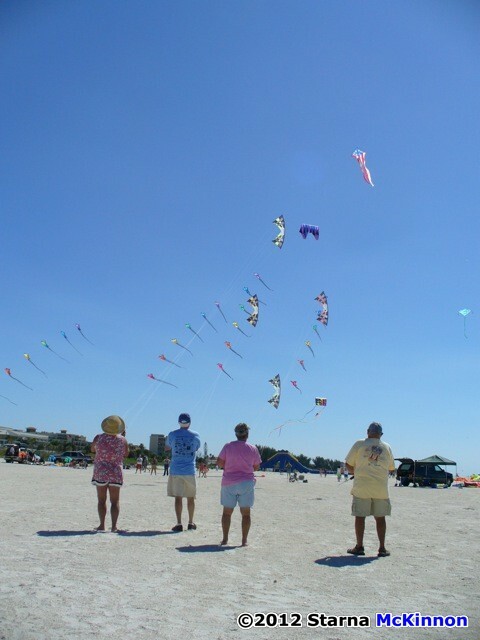 Next came Treasure Island Kite festival, January 2012, we took this opportunity to network with local and visiting flyers. We let them know about the Quad Squad event we were hosting in February and invited everyone. 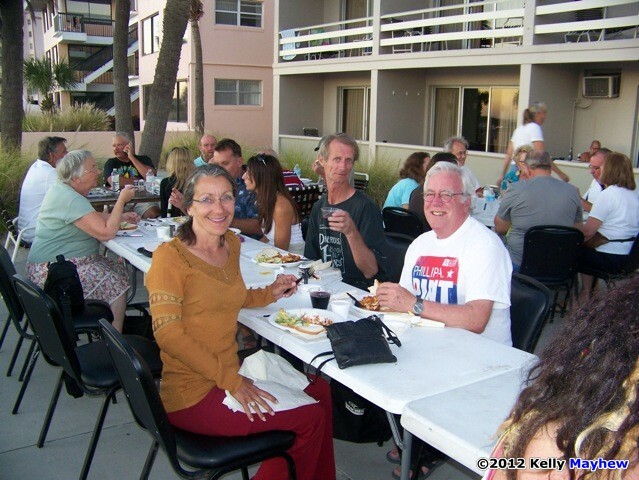 Finally we had success with a real great group of flyers attending that numbers well into the teens. 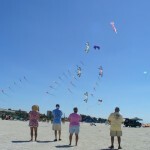 KTB was well on its way to resurging Treasure Island Florida as the Mecca for kiting in this region. 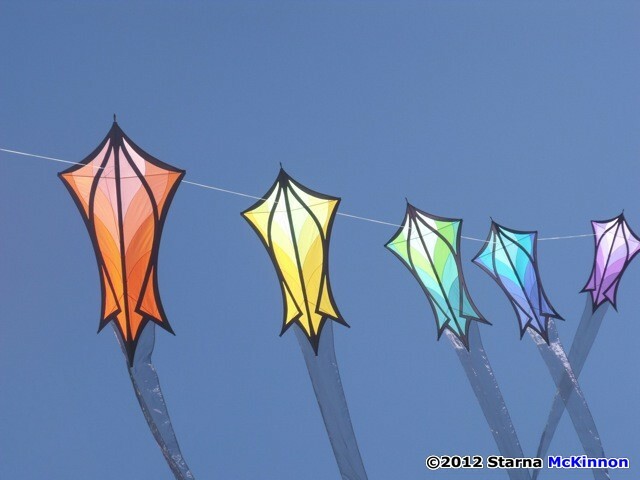 Starna and Kelly wanted to host a Kite fly on March 11th to honor those lost in the devastating Tsunami that hit Japan in 2011. 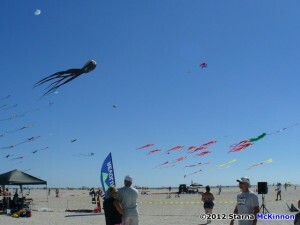 We dubbed the event “Kites of Hope”. Starna created a fantastic logo and Kelly promoted the event relentlessly on Facebook. 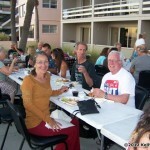 Pat Beckman contacted us and wanted to contribute by providing food for the Kiters. We created a Café Press store for t-shirts and buttons and all hoped for the best. 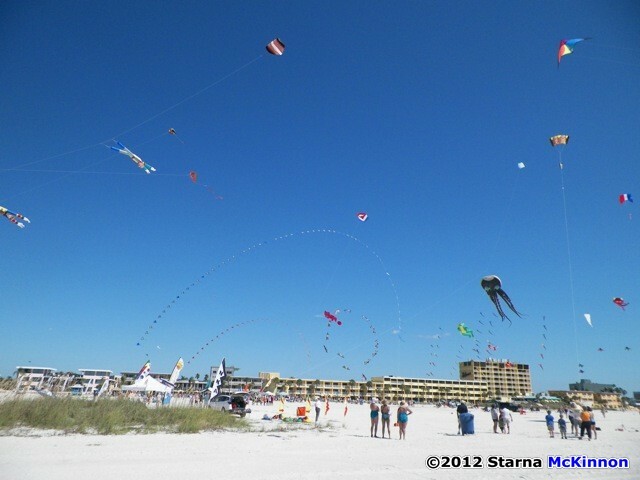 To our amazement, 65 Kiters attended this fly. Don Teeter created a Circa Flex Kite with the Japanese Flag and the date that was absolutely beautiful in the sky. 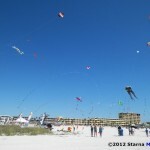 We had never seen more kites flying on an off festival weekend at TI beach. 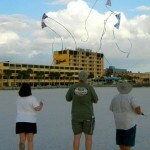 Kiting Tampa bay had arrived. We had the pleasure of flying with Alden in May for our “Alden Miller Fly”. As we talked to him about our one-year anniversary “Fun Fly” he suggested we host a festival so he had another excuse to come to Florida for the weekend. This was the moment KiteOberFest was conceived. 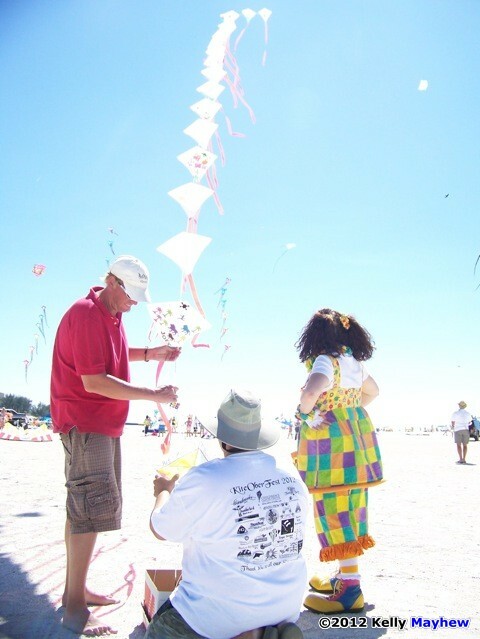 Our local kite shop owner, Joe Fala, from Windworks came on board to help create an event to remember. Kelly had discovered the Cancer Center through an icon of their Logo. It is a child running with a blue diamond kite. 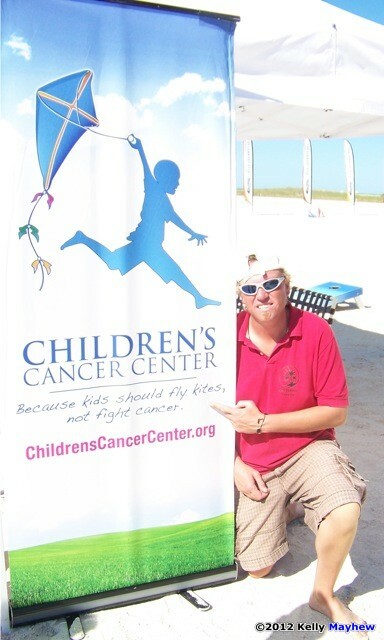 On their web site we read their motto “Kids should be flying kites not fighting cancer”. We instantly knew KTB needed to get involved with them. 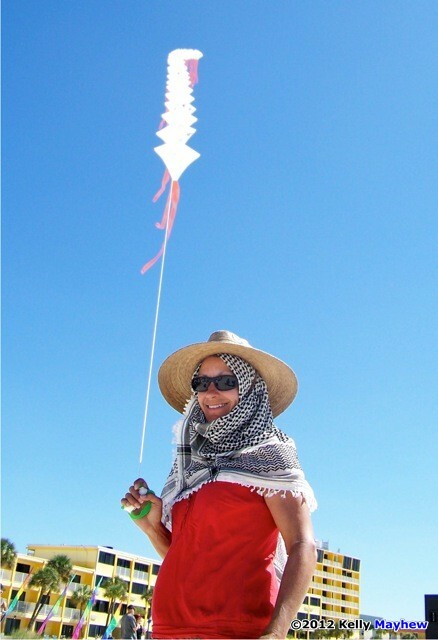 Throughout the year and we volunteered our time with kids kite making and putting up kites for their beach events. When we started KiteOberFest it was a no brainer to have them as our benefactor and they were very grateful we thought of them. Almost as soon as we posted the event Catherine Gabrel contacted us and let us know that she, Jim Day and Robert Brasington wanted to attend the event. WOW! We instantly made arraignments for them to attend. Did I say WOW!! 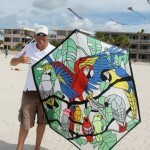 Other people started to contact us from local Kiters to other big names in the kiting world. Of course we had Alden Miller #1, but then more came on board like Rich Comras, Bazzer Poulter and Steve De Rooy (the rum Buddies), Gary and Maggy Engval, Kurtis Jones, Lisa Willaby and the Quad Squad (Steve Santos, Sue Moskowitz, Art St Pierre and Beth Bowen), Ben Dantonio, Tony Jetland and many more. An amazing group of people wanted to come and help benefit the Children’s Cancer Center. We still were not sure if we could raise more then $5 for the center. Kelly came up with a great idea. 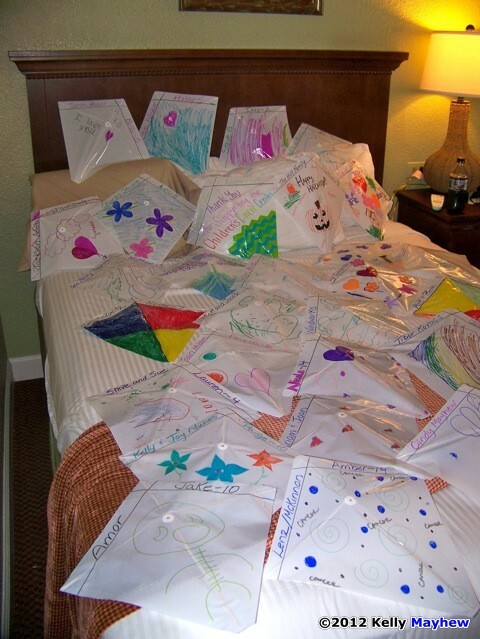 Catherine donated a Kite Train with 60 white kites to the cancer center, thank you again Cat, and anyone could purchase a Kite skin for $25. One of the centers kids would do the artwork on it and leave a space for the Donors name of choice, maybe a family member or friend who suffered from Cancer. This was posted on our web site along with the CCC’s web site and now we had a guaranteed donation. Problem solved. Now it was time to focus on the Auction. Again, we put the word out that were raising money for a good cause and needed donations. 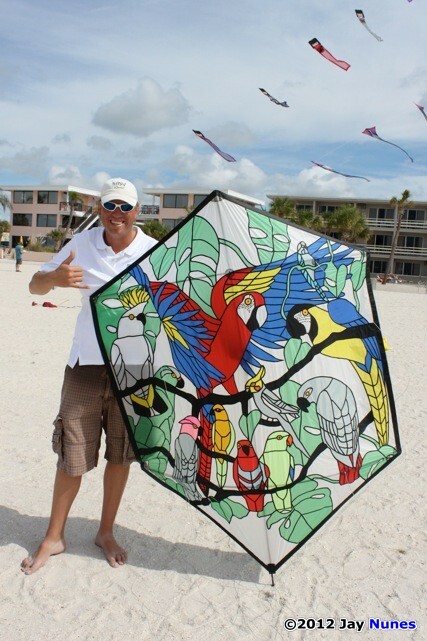 We have to thank Kevin Bayless for our first Kite donation, a beautiful ribbon Roc. 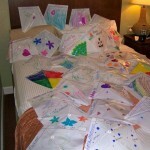 There are too many more names and Kite companies to mention for the amount donations we received. 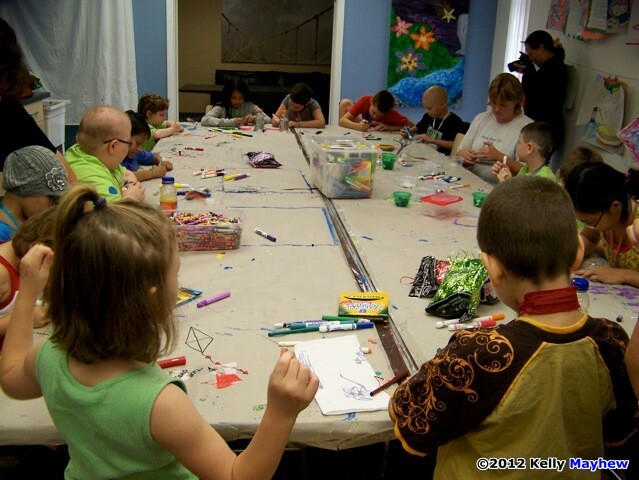 Items from Kites to Kite pins, Mini Kites to trinkets, Art by Art to Puzzles and more… We are still so grateful for everything that we received. Thank you all so much. It’s Thursday the 18th and kiters are arriving from the airport and driving into TI. As they settle in we decorate the Thunderbird’s Lobby and address the final details. 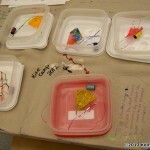 On Friday we sorted out the donations set up each kite. Starna McKinnon cataloged each item into excel while Sue, Beth tagged and arraigned each item for auction. Wow what a process. Thanks again Sue and Beth for helping us. Another special thank you to Starna who worked so hard to make sure we had our Logo and all of out technical items well in hand. You are a fantastic organizer and we could have never done this without you. 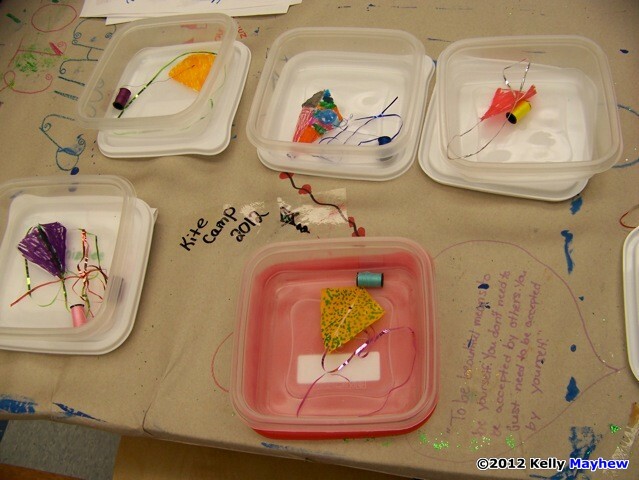 With the auction ready to go, it was time to assemble the Kite train. 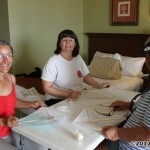 So, Cat, Jim D, Beth , Kelly and Robert assembled it in our Motel room. It went together quickly. But as it was being made we were all tearful from time to time in seeing it come together and knowing what it stood for. The Friday night Social was a roaring success. We know cause motel security only had to chat with us once. 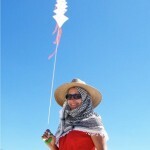 ;o) There were lots of night kites from quads to single lines but the biggest hit was the Fire juggler out on the beach. 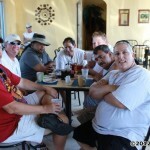 After that we all hung out on the beach side of the hotel and shared a few and laughed till the wee hours of the morning. My buddy Paul and I grabbed our Ukulele’s and we all sang a few songs together as well. God I haven’t laughed that hard in a Long time… There was a feeling that evening I remember from when I started kiting. 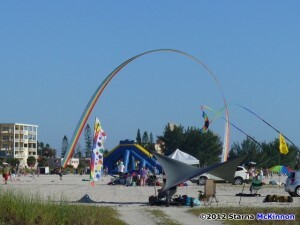 The Fields are set, the venders are in place, The CCC was set up and it’s officially time for KiteOberFest to begin. 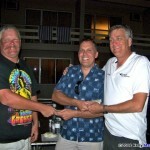 Kelly, Starna, Joe and I could not believe what KTB, Windworks and the kiting community had accomplished so much in such a short time. Rich Comras started us off with a patriotic fly and were on our way. The Rum buddies put on a two man, 4 Kite Quad Line display that was truly inspiring to everyone there.. Steve flew his 2 quad demo that is just a freak of nature. Amazing as always Steve. Lisa flew a dual line demo that beautiful as always.. Then the 4 flyer Rev teams naturally formed and flew iQuad inspired demo’s that were truly a joy to watch. Of course we had a mega Rev fly that mesmerized the crowds. Outside the Demo field Robert Brasington put up a breath taking kite display. 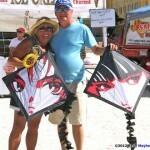 Gary Engvall and Pete Dolphin launched a huge display of large show kites. Tony Jetland and Ben Dantonio gave Dual and Quad lessons all weekend long and really shared what we love with the public. I think my Favorite part of the afternoon was watching the demo flyers run off to the Pool for a dip and Margarita’s. This is that kind of an event. It was all about doing what we Love and having fun all the way through. 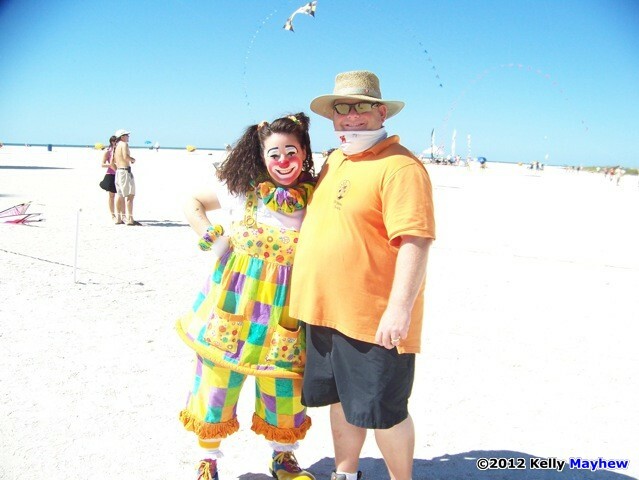 One of our KTB members, Robin Johnson, actually donated a Clown to the Event. Her name was Zoe and she was such a joy to have at the festival. 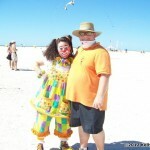 She had a blast at the CCC area and made balloon animals for all the kids on the beach. Thanks Robin for such a thoughtful donation. If you do not know Pat Beckman, our executive food officer (EFO), and her crew your missing out on some of the greatest people we know. 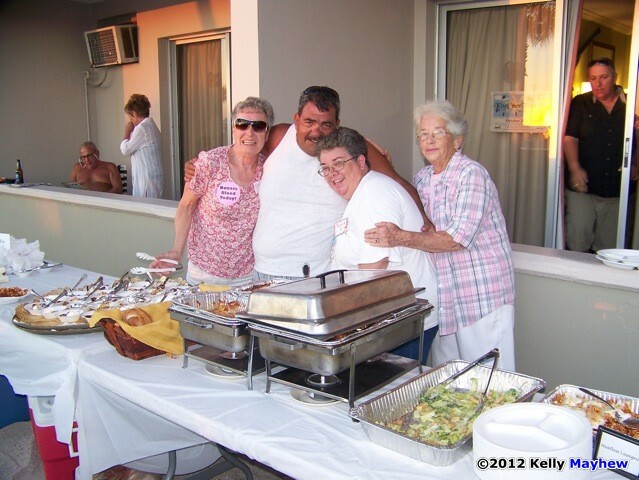 When they heard we were hosting a charity event, Pat called me Immediately and said “We want to donate food for the Kids and what ever else we can do to help, you just let us know”. 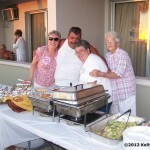 These ladies worked so hard to create a banquet dinner for all the Kiters and there is not enough I can say to thank them. They set up seating for 75 people beachside with beautiful table settings that looked amazing. They cooked us the best “Lazy Gals Lasagna” I ever had. There was salad, garlic bread and mouth-watering deserts and seconds to boot. What was so amazing was how they did it. Out of the Hotels little tiny kitchens. Running between a few peoples rooms to get it all cooked for us. Ladies, Thank you from the bottom of our hearts for all you did to help. You’re amazing. We invite Alan from the Children’s Cancer Center to say a few words before we begin. 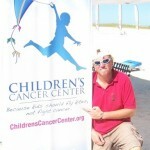 He explains what the CCC really does for the families affected by such a tragic disease. It is not a Hospital and it is 100% funded by donations. The CCC is the bridge between diagnosis and treatment. They help all the family members cope with the situation not only monetarily, but through counseling and group therapy as well. 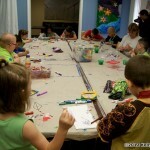 They also provide a safe place for the inflicted kids to come and feel normal for a while. All of them have the same issues so those issues disappear while they are at the Center. We can’t imagine what they are going through; we just wanted to help. 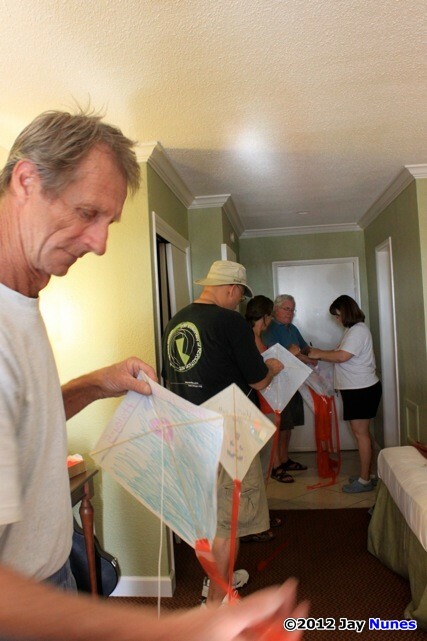 We also presented a Diamond kite to Alan created by Kevin Bayless that is an exact duplicate of the CCC Kite in their Logo. Thanks again Kevin for your fantastic work. He has it hanging in his office for all to see. Of course we asked Bazzer to be out auctioneer and I even got to be his sidekick. Besides, who could resist that English accent? We also had the best-looking Vanna ever with Steve. So the production begins. Sue, Beth and Kelly in the Hotel room.. Steve is on the porch. Bazzer and I just outside with microphones in hand. Starna has her computer set up to the left of us. The banquet tables are beachside and everyone has a paddle with a number on it.. Alden Miller of course got the #1 paddle for he was the one that started this whole shindig off.. Were all set.. Here we go..
Sue is picking the Auction Items and Kelly hands the Item to Steve. Steve holds it up for the crowd. Bazzer and I auction the Item. Starna logs in the details. Steve hands the auctioned item back to Beth and Kelly and they break it down and pack it back up. And the Process works like clockwork. 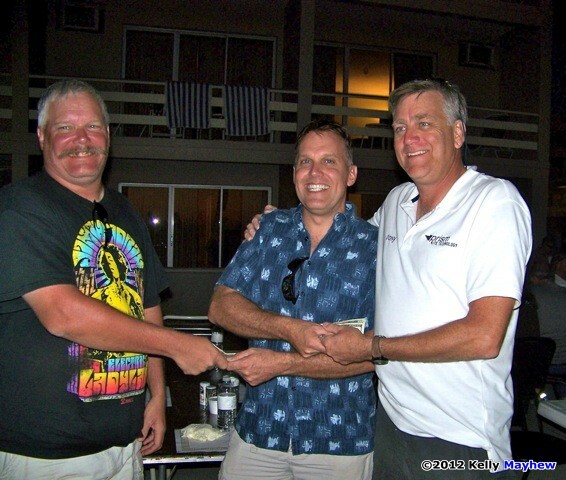 We Auctioned off 65 Items in 75 Minutes and raised $5540.00 for the CCC.. Alden Miller and Tony Jetland learned there was Kite skins left from the Kite train and purchased the rest. Outstanding guys. Sunday was another perfect day for kiting. Really good winds and 80 degrees in October and you have to love that. 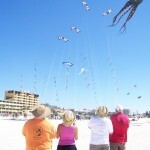 We flew demo’s all day and just really had a blast sharing our Love for kiting with the crowds. 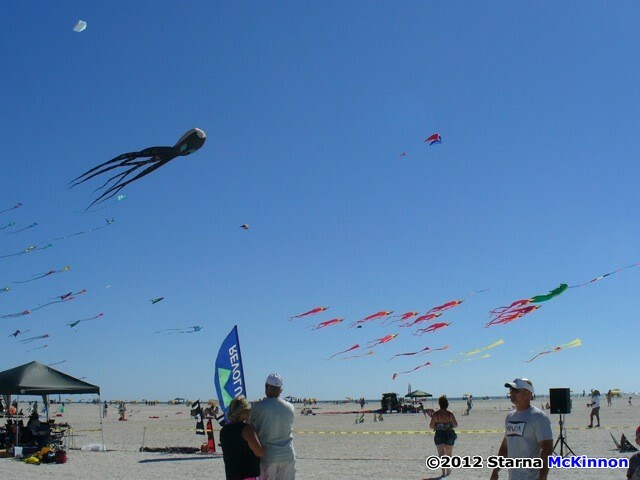 This event has that old school feeling I fell in love with when I first started kiting. It was really great to experience that again. As the sun set on Sunday no one wanted the event to end. We had gone way beyond what we ever expected in fund raising. We created something new that feels like an old comfortable pair of shoes. The response from everyone was amazing and we plan to do this for years to come. 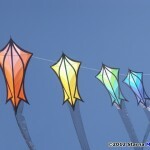 KiteOberFest is a roaring success. 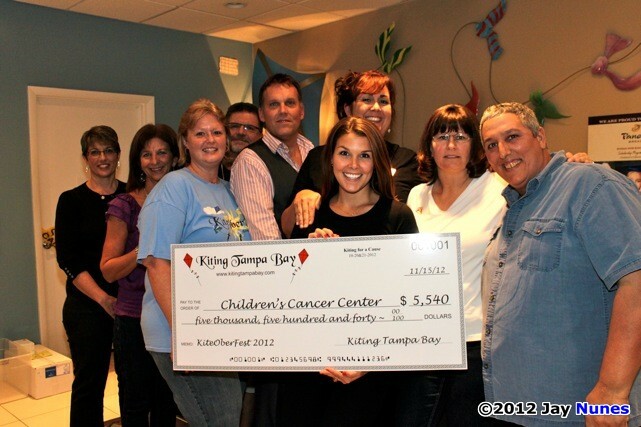 All of us here at Kiting Tampa Bay cannot thank each and every one of you for your contribution to making this happen. We could not have done it without you. 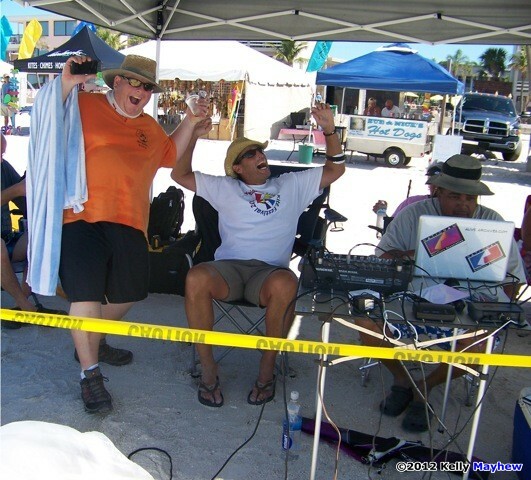 This entry was posted in KL Archive and tagged charity, featured, Florida, Tampa Bay.